One of the most evocative aspects of owning a V8 engined car is the intoxicating sound from the exhaust; it simply makes a power statement that is unmistakable. In decades past even the most restrained V8 engined cars were able to retain this sound, but creeping legislation in recent years has demanded that exhausts become quieter and with this comes a sanitisation of the sound produced. Some makers like Lexus, Mercedes and Jaguar opted to prioritise silence and refinement and simply use the torque of a V8 configuration to provide ‘adequate’ urge. Indeed Rolls Royce have for decades used basically the same V8 engine in 6.2 and more recently in 6.7 litre form, not that you would known it is a V8 wafting you along. The MG ZT 260 arrived with a compromise in terms of exhaust system as it had to pass the drive by noise requirements, but also had to be reasonably sporting. There is no mistaking there is a V8 generating the sound, but it is quite muted in standard form with just the distant but promising burble. The standard car does make the right statement in terms of the tailpipe design by having a silencer exiting on either side of the rear panel and each having a twinned tailpipe. This quad arrangement has for years been the statement of a performance car with a V8 and is commonly seen on BMW M cars, AMG Mercs, Ferrari and similar cars. Those cars with V8s and perhaps just twin tailpipes seem to lose impact and the Audi RS4 may have superb credentials but with smallish twin pipes it looks little different to an A4 2.4. Some may prefer this but if I was paying the hefty premium demanded over a mainstream A4, I think I would like something to show for this, but others may not. Sound levels too are to a degree a personal taste issue, but most owners wish for something better than the sanitised levels most cars have to be built too. Some like them to be really loud and the looks brash and here the former MG Rover Chief Executive is one such person whose influence on the aftermarket exhaust by MG Sport and Racing for the 260 is plain to see – and hear. Now we see their first mistake in deleting the quad pipe tailpipe and replacing it with a large single oval, or just what the Max Power 19 year old would glue and screw onto the back of the standard exhaust of his Corsa. Certainly a single outlet is far easier to build, but having had an XPower silencer apart it does shout that it was done to a price ceiling! Next issue, certainly present with earlier examples, was a nauseating resonance that permeated the car in the 1500 to 2000rpm band and was on some pre facelift cars I drove, genuinely intrusive enough to generate a nauseating feeling if the rpm was allowed to remain in this band. Facelift cars have a marked development in refinement and this seems to be beneficial in reducing the effects of this resonance to just annoying. The sound generated by these echoes that certain Chief Executive too and whilst louder than most owners would wish for, except on odd occasions, it certainly announces the presence of a V8. With other XPower branded exhausts for other models being so generally effective and visually better than standard, it was a great disappointment to see the offering for the 260. The only option therefore was to source an alternative design and with no known off the shelf alternative available commissioning a new design was the only option. Zero Exhausts in Ashford in Kent had already built a reputation for quality and effective exhaust systems for a variety of cars from Vintage race to Modern high performance saloons, and anything in between. 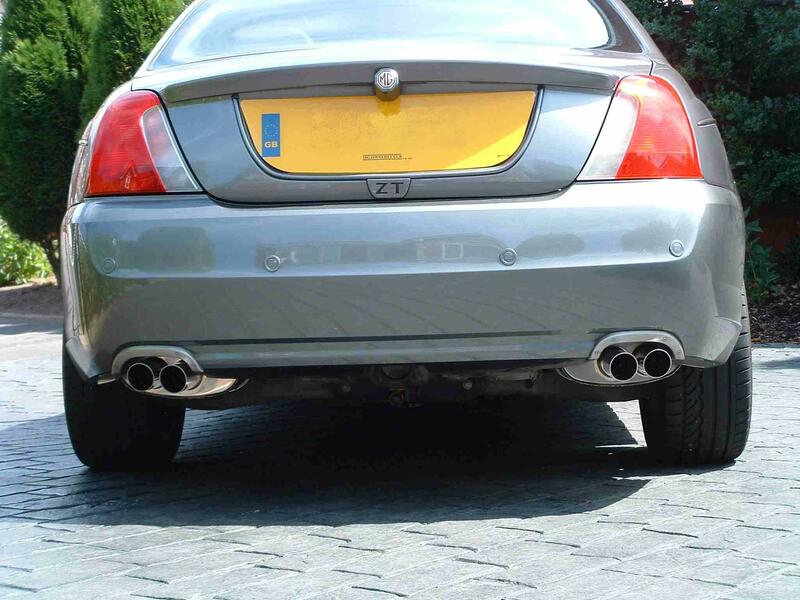 For these reasons when the ZT XPower 500 was bought and the exhausts that were originally fitted were missing, not that they could be fitted with the new bumper – hence their removal – new one-offs were needed. Zero made up some custom new rear silencers with a one off design of tailpipe to match the restyled features of the rear bumper panel. Made from high quality 304 stainless and subject to polishing afterwards, they also benefited from the use of high quality internal perforated pipe and long life quality wadding. The sound from these is awesome when the supercharged power unit is given even a small amount of its head, so it was a logical decision to choose Kevin at Zero to create the replacement boxes I wanted for the 260. The design criteria set was that the boxes should be a direct one for one swap with the standard boxes, that they retain the quad tailpipe design, the materials should not rust as the lower quality stainless materials used in the standard silencers does. Finally they should provide a greater but controlled sound level, but not like the XPower silencers. Development required dissection of my spare standard silencers which showed a number of restrictive features, but the materials used inside were higher quality. There is also a rather convoluted path for the gasses to follow inside the silencer with small bore apertures for the gas to pass through with clear intention to reduce sound emission, but by doing so also reduce gas flow. Configuring the new silencers to accommodate the offset inlet and a twin tailpipe per silencer and yet still accommodate enough chamber and material for silencing purposes was challenging. The layout gives essentially a single silencer per bank, although the system is joined for a short distance over the rear axle to provide the advantages of a crossover balance pipe, and help packaging the exhaust in a confined space. There is also a cat per bank which also does provide some silencing benefits, but most silencing is left to the two back boxes. The characteristics of this layout is seen with the XPower silencers and the obvious problem area, beyond fitting all that was needed in the same sized silencer, was overcoming the clear resonance generated in that 1500 to 2000rpm zone. Indeed this has created the only real problem, as within the bounds of the available space and the desire to have the V8 sound, the total elimination of the resonance has not been possible, although the level is reduced to manageable levels and held between 1400 and 1500 rpm on an open throttle. The level of resonance is greater when new and before the silencer infill has heated and expanded, and I have noted that it is also reduced when the exhaust is running hot. Having now covered in excess of 500 miles with the new silencers I can confirm that everyone who has experienced them from either outside or inside has only positive things to say and it has drawn a whole host of positive comments when at the petrol station, which most of you know is a reasonably frequent stopping point. On the subject of fuel consumption I note my fuel usage as a means of detecting problems, but it provides a useful comparison with reasonable accuracy as my mileage is usually quite regular and the filling station used is the same and often the same pump too with brimming each time. In the 607 miles before fitting I used 112.5 litres giving 24.52mpg averages. In the 604 miles since fitting I have used 107.8 litres equating to 25.47mpg. This is a move in the right direction and if over a longer period the gain is maintained then this will be a bonus. Like the possible fuel consumption bonus comes the prospect of extra power. Not one of the original design parameters, but when clear restrictions are being removed then there is always a good chance of a power gain. Not that this would ever be substantial, it would be welcome nevertheless. Now this is not substantiated with any form of rolling road test as I would normally do, but from a seat of the pants perspective the engine with the new silencers is definitely clearly sharper to respond to the throttle when rpm is above 2000rpm and it does seem to gain rpm faster too, so that can only be showing a power gain. Here the sharper throttle response is actually more use than any quantified power gain as the rather sluggish response of the engine when blipping the throttle has always been a little disappointing. Interestingly with my car I sourced a pair new pair of standard silencers which when the Quads were commissioned I was loath to donate for dissection. So I replaced my original fit silencers which had suffered some surface degradation and donated these for the programme. That means though that I have experience of two sets of standard boxes to corroborate the ‘standard’ start point and so the gains perceived will be likely to apply to other cars running standard silencers. Now available to order from Kevin at Zero Exhausts at £375 plus vat per pair, Zero Exhausts can be contacted on 01233 638193 www.zeroexhausts.co.uk and view some of their work. My fitting was a doddle and took all of 30 mins for both to be fitted! Do bear in mind though that since I had already replaced my silencers recently and previously taken the trouble to Coppaslip the fixing nuts and bolts, it all slipped apart like it always say it does in workshop manuals. With the silencer clamp fully loosened and then the strap bolt removed and the strap hanging down it is just a matter of twisting the silencer to break any seal between it and the input pipe and slide off. This type of exhaust clamp doesn’t clamp so hard there is pipe distortion to overcome. Next the strap is removed by twisting it and releasing it from the fixed upper strap. Take the new silencer strap and trial fit it to ensure the cut outs allow the strap to be turned into the correct position for fitting. If the strap doesn’t fully turn then a little extra relief needs to be filed in the two grooves in the new strap. We have found a little variation in factory straps but believe the supplied straps will not have this issue. Now turn to the removed silencer and look at the input end. Examine the strap and note that it has a single spot weld that fixes the clamp to the intake pipe of the silencer. Carefully drill out the spot weld on just the clamp side so you don’t make a hole all the way through. Usually a couple of increases in drill bit size from 3mm to around 6mm will be enough. Now you slide the clamp off as you will be re-using them on the quads, but being careful makes simple refitting of the original silencers viable if the need arises, when selling the car in the future perhaps. Sometimes these clamps will actually break off without the need to drill, so give them a wobble to start with. Another issue that may be faced is the small M6 (8mm head) bolt that holds the strap may be rusted and shear. If this does occur then you need to remove the captive nut and then simply replace with a normal nut and bolt. Use flat washers as appropriate to ensure a secure spread of the clamping load to ensure a sound fitting. Now the fitting of the Quads commences. First slide the clamp onto the main silencer pipe and move it out of the way. Then trial fit the new silencer intake pipe onto the exhaust system. It is designed as a tight fit, but the new silencer pipe may just need a small gentle tapping to ease the pipe open a touch more. Lubricating is helpful, but not if you intend to use any exhaust assembly paste. I used neither and found that once the edges just started that a little gentle rotation and slight wobble motion would allow them to slide on fully. Initially use the witness marks from where the original silencer fitted up to as a guide, it will hang without the strap but use a jack (on the silencer outer end with a good rag to protect the finish) to hold it at the correct height so avoiding strain and possible distortion. Next take the new strap and engage the slotted end with the original upper strap. Now use the original bolt, or the new nut and bolt, to secure the strap and lightly tighten. I suggest that Mole grips set at an open setting will hold the two straps close enough to enable you to engage the bolt into the nut. Check the position of the tailpipes and note that these are a few mm longer than standard, if needed then slide the silencer onto the pipe a little more. Check the tailpipe position relative to the exhaust trims on the rear bumper panel and adjust as required. Now slide the main exhaust clamp into position and tighten fully. Next tighten the strap bolt fully and recheck tailpipe position. There may be a little rotary movement during the final tightening of the strap that moves the tailpipe position, hence the tightening of the clamp first to help resist this. Finally I suggest applying a little Coppaslip grease to the clamp and strap bolts to deter corrosion and allow simple removal at any time in the future. Repeat the process for the other side and then start the engine and check for any gas leaks around the clamp and pipe join, I would not expect any. Run the engine to allow heat to reach the silencers or take then car for a short gentle run. Recheck the fitted position after this run and if needed you can adjust the silencer position if needed. Remember that the sound level will not be true until the car has had a good run and the silencer has got hot and the internal wadding has had time to expand.